JPMorgan Chase is a top-three bank in most of its business lines across North America. Its relative stability has helped it to increase its market share. The bank surprised analysts with stronger-than-expected earnings of $5.43 billion in the second quarter of this year, an increase of 13% from the same period a year earlier, as investment banking profit and revenue surged. Overall revenue rose 7% to $27.4 billion, with half of the increase coming from J.P. Morgan, the investment bank. Provisions for credit losses across the bank were lowered to $1.81 billion from $3.36 billion a year earlier, as credit quality improved. “Our earnings power will allow us to generate significant capital in excess of our objectives, allowing us to aggressively invest in our future,” CEO Jamie Dimon said earlier this year in announcing a $15 billion stock-repurchase plan. “JPMorgan Chase has substantial organic growth opportunities—building branches, adding bankers and expanding product and service capabilities globally. Quality organic growth is our top priority and our best use of capital,” Dimon says. "JPMorgan Chase has substantial organic growth opportunities"
BNP Paribas weathered the financial crisis better than most. Having entered the crisis with less risk exposure than many of its peers, it also benefited from an economic recovery that was quicker in France than in many neighboring countries. The bank took advantage of the turmoil to pick up some bargains, including most of Fortis Bank in Belgium in 2009 and Fortis’ Swiss bank and its investment activities in Australia, complemented the bank’s existing portfolio and helping BNPP to rise above its peers in the European banking landscape. BNPP is now the largest bank in the world, by assets, with some $2.9 trillion on its balance sheet. It has a well-diversified book of business, with no single unit weighing too heavily on its overall risk profile, adding to its strength and safety. The bank has been steadily increasing capital ratios. BNPP’s first-quarter 2011 profit rose 15%, aided by its French and US consumer banking businesses. All three key divisions, retail, investment solutions and corporate and investment banking, contributed to the results, which beat analysts’ forecasts. HSBC takes the regional crown again this year, thanks to the rise in profitability across the Asia Pacific region (excluding its core market of Hong Kong), which contributed $5.7 billion in pre-tax profits in 2010, the largest percentage contribution (31%) in terms of underlying group pre-tax profits. The bank’s ongoing expansion in China and development of renminbi-based financial products to service the growing offshore market remain key differentiators, as well as its strong banking franchise in countries such as India and the expansion of its Islamic banking arm, HSBC Amanah, in Malaysia and beyond. It is also playing an enlarged role in helping small and medium-size businesses grow by providing credit facilities. While monetary tightening was applied in China to reduce credit growth, most Asian economies continued to perform strongly in the first half of this year. Spain’s Banco Santander, Europe’s largest bank by market capitalization, has continued to offset weakness at home, a market with more than 20% unemployment and a catalogue of bank consolidation, by investing in Latin America. With operations in Mexico, Argentina, Uruguay, Chile and Brazil, the Spanish banking giant is already the largest financial group in the region, and it is now exploring opportunities in Colombia and Peru as well. While Santander reported an 8.5% decline in net attributable profit last year, to $2.4 billion, its profits in Latin America grew 25%. Latin America is expected to account for half of the bank’s overall profits by 2012. Brazil alone contributed 25% of 2010 profits, growing 31% year-on-year. In 2010 the bank acquired the remaining 25% share of Banco Santander Mexico—which holds 13% of Mexico’s market for loans and deposits—from Bank of America for $2.5 billion. Santander’s overall loans and deposits in Latin America expanded by 30% and 28%, respectively. Its broad product offering, technology investments and varied corporate social responsibility (CSR) activities continue to benefit the region, and it is consistently pushing the bar higher for the Latin American banking industry, setting important benchmarks along the way. Herbert Stepic, CEO of RBI, says: “Our business model is both basic and sustainable. We focus on classic financial intermediation, offering our customers safe and attractive ways to deposit their funds and making those funds available to the productive industry and to our millions of private customers in the CEE. "Our business model is both basic and sustainable"
National Bank of Kuwait, the highest-rated bank in the Middle East, has continued to perform well despite the ongoing turmoil in global financial markets and the political unrest in the region. NBK’s earnings rose 14% in 2010 to a record $1.1 billion. First-half 2011 profits rose to $534 million from $529 million for the same period last year. “As a leading regional bank operating in 17 countries, NBK continued to enjoy a highly recognized brand in the financial services sector and is indeed among the leading brands across the MENA [Middle East and North Africa] region,” says Ibrahim Dabdoub, group CEO of NBK. The bank has focused on strong asset quality and improving its capitalization in order to differentiate itself in a time of upheaval in global banking markets. “NBK’s world-class credit ratings assert our strong financial position, long-term positive outlook, sound risk-management practices and the stable and highly proficient management team,” Dabdoub says. In addition to its 71 branches in Kuwait, which is more than any other bank has, NBK has a growing regional and international network. NBK moved into Islamic banking in 2009, with the purchase of a 40% stake in Boubyan Bank. The stake was increased to 47% last year. London-based emerging markets bank Standard Chartered delivered record profits for an eighth consecutive year in 2010. Net earnings jumped 29% to $4.2 billion last year, while nonperforming loans were slashed by more than half. 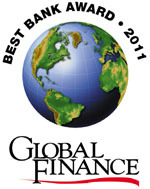 The bank said it expected to report a double-digit growth in profits for the first half of 2011. Standard Chartered receives more than 90% of its income and profits from Asia, Africa and the Middle East. “By combining our global reach with our local expertise, Standard Chartered has been leading the way in introducing innovative new products and services to our 14 African markets to match the increasingly sophisticated requirements of our clients and customers,” says V. Shankar, CEO for the Middle East, Africa, the Americas and Europe at Standard Chartered. “Present in Africa since 1863, we have consistently demonstrated an unrivaled commitment to our people, customers, clients, communities, investors and regulators for nearly 150 years,” Shankar says. The bank has made continuous efforts to strengthen its leadership role in Africa, which is core to the group’s strategy, according to Shankar.